Are you ready for some PINK talk? First…ScrapPink. What is ScrapPink, you ask. I’ll tell you!! It’s three days of scrappy fun with friends! Friday, September 26th to Sunday, September 28th. There will be prizes and drawings and make-n-takes and awesome challenges. This is the first year that I am able to go and I am so, so excited about it!! If you live in the Denver area (or even if you don’t! ), get signed up and join us. You won’t regret it!!! If you want more information, check out this link. Second…Race for the Cure. Our race here in Denver is on Sunday, October 5th. I will be running again this year. How can you help?? Well, you could race too! You don’t have to run. You can walk. You can also “work out for the cure” OR “sleep in for the cure”!! And if you can’t do any of those, you could always support me! *wink* Click here to visit my personal page. Make sure that you click on “Support Heather” for the pledge to go towards my goal of $500. If you need a little incentive…I’m going to give it to you!! 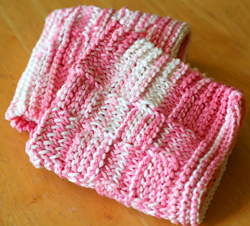 I am hand knitting these cute pink dishcloths. If you pledge $20 or more toward my goal, I will send one of these lovelies to you as a reminder of your generous gift. Thank you for listening. And thank you in advance for your support! With your help, we *can* and *will* find a cure! You knit too! Truly there is no end to your talents. I like the idea of sleeping in for the cure. More up my alley than a race. 😉 LOL at MK’s comment! that grasshopper on avery’s nose is from one of my childhood nightmares. i’ll have to scrap about that memory. can’t wait for scrapPink! Kelly wants to know if you have a “Time Management 101” course available on line. If not….. could you possibly find the time? My bad! What was I thinking? Look who I’m asking! you need to update your blog. geez. Hey, I think everyone wants an update on the race. Did you get pictures? ?